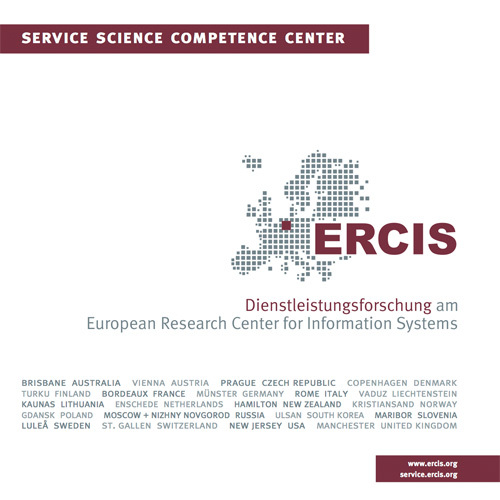 DESRIST 2017 | ERCIS Competence Center "Service Science"
The DESRIST 2017 took place from 30th May to 1st June 2017 in Karlsruhe, Germany. Together with Samir Chatterjee (Claremont Graduate University, USA) and Brian Donnellan (Maynooth University, Ireland) Prof. Becker contributed as the Theme Chair for Domain-specific DSR Applications. Besides cross-domain topics that are in focus of information systems research (e.g., business process management, social media, big data etc. ), specific domains (e.g. manufacturing industry, financial industry, healthcare, energy, tourism, retail, e-government etc.) often exhibit problems that are special to the respective domain. Consequently, common problem solving means are not sufficiently appropriate to address these problems as they require individually adjusted specifications. Thus, this theme of domain-specific DSR applications is aimed to present DSR-based solutions that provide a specific approach to a particular domain-specific problem by combining relevance and rigor. DELFIN - "Services for Electric Mobility"
FOKUS:SE - "Researcher Network Service Engineering"
ECIS 2016 - "24th European Conference on Information Systems"
ECIS 2015 - "23rd European Conference on Information Systems"